Initially, the overall idea behind this blog was to introduce you to my curatorial hero of all time, Michael Rogers Oldfield Thomas (1858-1929); however I quickly tempered my ambitions as I would have never been able to do justice to his substantial academic and curatorial legacy. During his time as curator of Mammals at the British Museum of Natural History, Oldfield Thomas developed one of the most comprehensive collections of mammals, produced over 1090 items of published work and provided names for more mammal genera, species and subspecies than anybody has ever done or will ever do. It is probably because of this vast body of work that nobody to date has dared to write the book that such a prolific character deserves. The ironies of life … so little written about a man who wrote so much! A couple of obituary notices and a brief memoir written up by John Edward Hill and published in the Bulletin of the British Museum of Natural History give us only the faintest glimpse into the life of this man. So it is high time someone addressed this deficiency and who better than Oldfield Thomas himself. 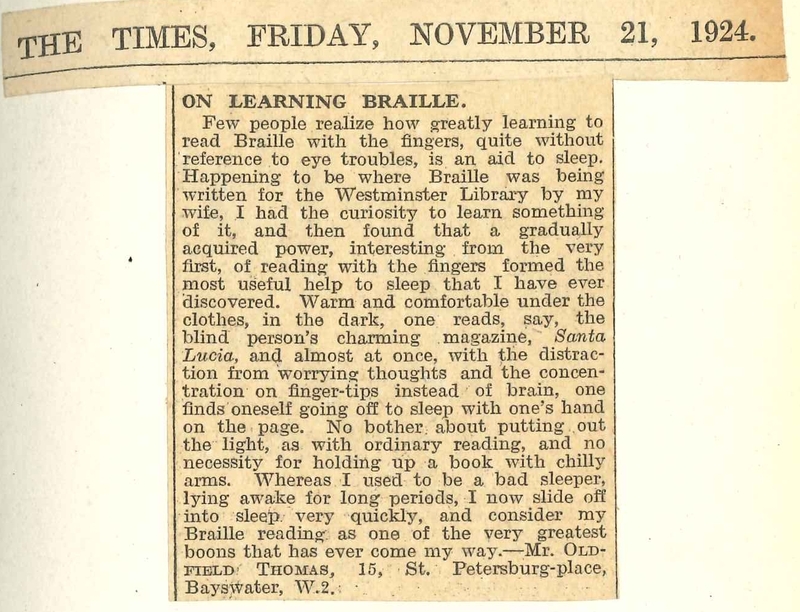 Going through his personal volumes at the Museum, you can find newspaper cuttings that show another side to this otherwise deeply committed mammologist. 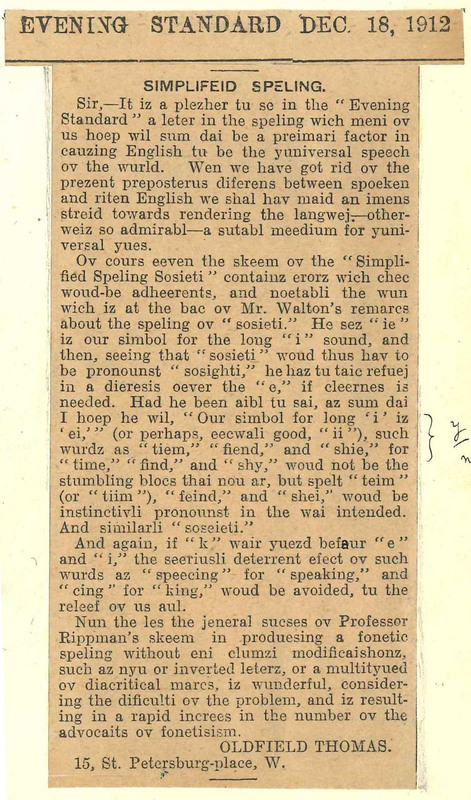 Oldfield Thomas, which like the rest of us also had a life outside his work place; a life filled with worldly preoccupations; preoccupations he felt compelled to share with his contemporaries by means of the great British tradition of writing letters to the editors of newspapers. Make of his ideas what you will, but I applaud his effort to appeal to his fellow people when he felt that there were opportunities to advance our knowledge and foster progress in all aspects of life. In order to illustrate this, I have divided some of his popular press contributions into thematic sections which I hope should demonstrate a personality imbued with the spirit of the Enlightenment and with as big a heart and brain for natural history as for life general concerns. 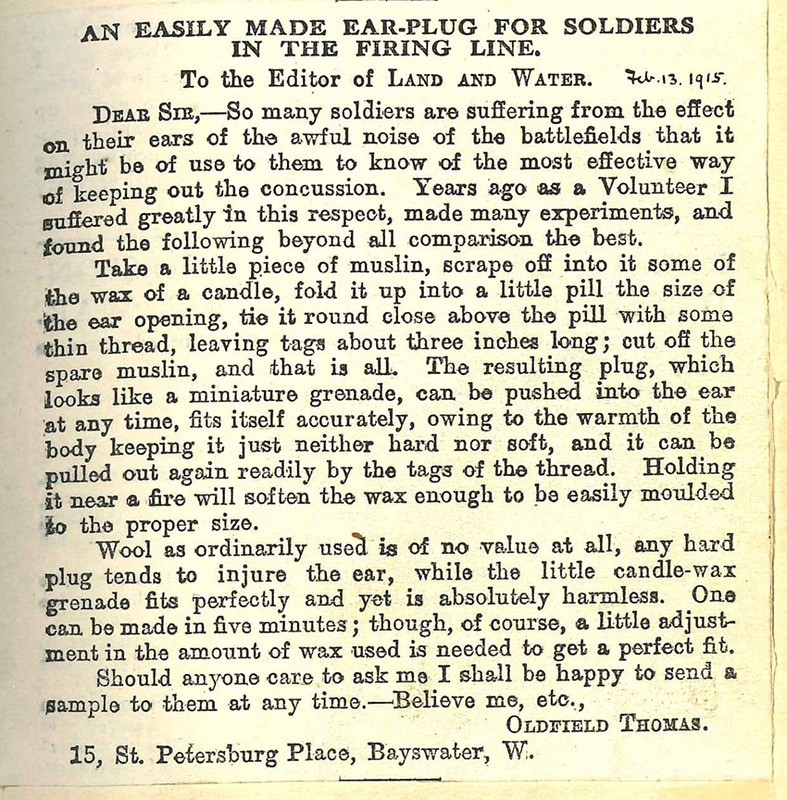 In this letter to the editor of Land and Water published in 1915, Thomas proposed a design for what was in essence the first ergonomic earplugs. At 57 years of age, Thomas was too old to be sent to the frontline during World War I, but he still cared deeply for those who did and their suffering. © Courtesy of the Trustees of the Natural History Museum, London. 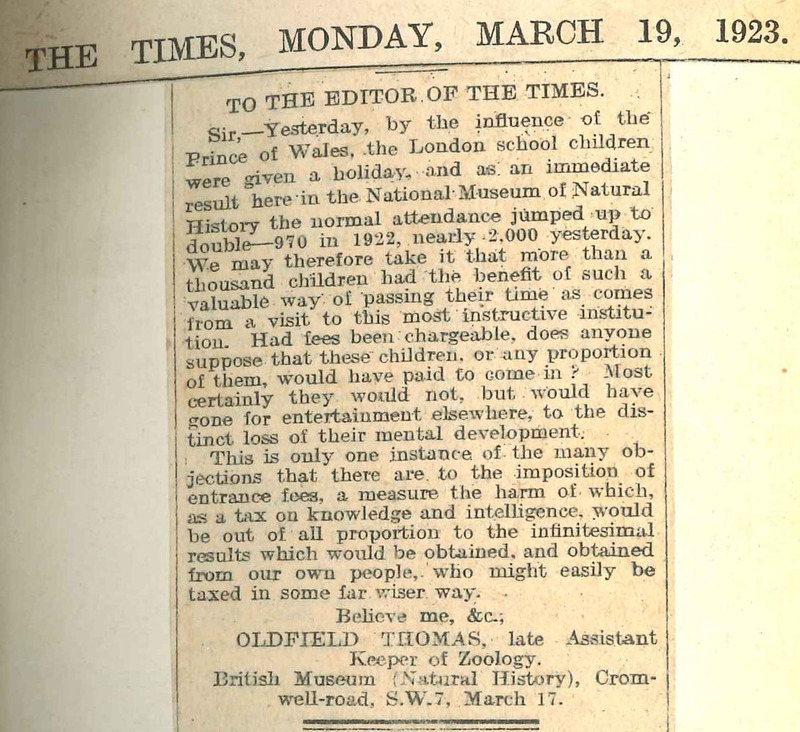 This fascinating letter to The Times from 1918 shows the views of a man concerned with the environment, overfishing in particular, and the responsibility to sustainably manage this natural resource. 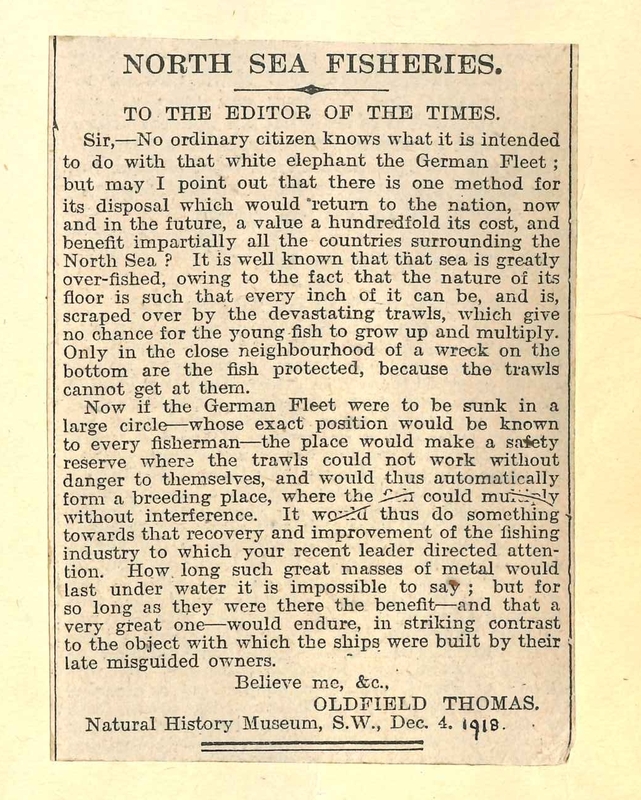 To this end Oldfield Thomas proposed the sinking of the German Fleet to provide breeding grounds and protection for fish. I do not know how influential Oldfield Thomas was in his time, but the majority of the German ships were actually scuttled at Scapa Flow a few months after this piece was published. 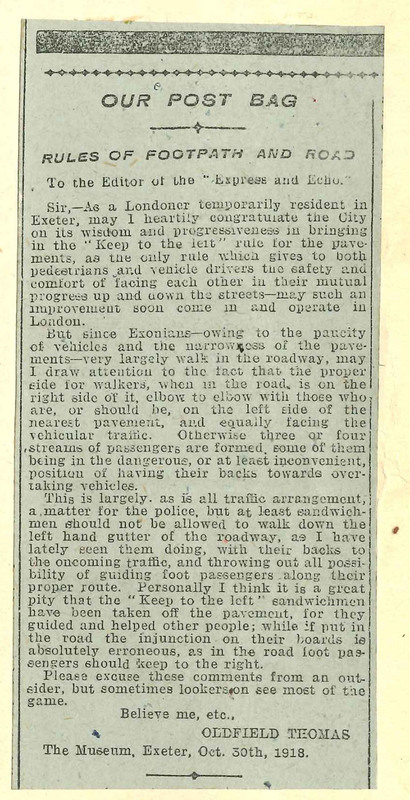 I still find this letter to The Times from 1924, revolutionary, and I wonder why it never caught on. It strikes me that his advice makes a great deal of sense and should still work today as well as it did for him back then. Lack of sleep is known to have a great impact in health, so laugh off his recommendation at your own peril. From this letter one wonders if Oldfield Thomas was truly interested in saving the world from flu or mostly hoping to encourage people to become more frugal in their eating habits. 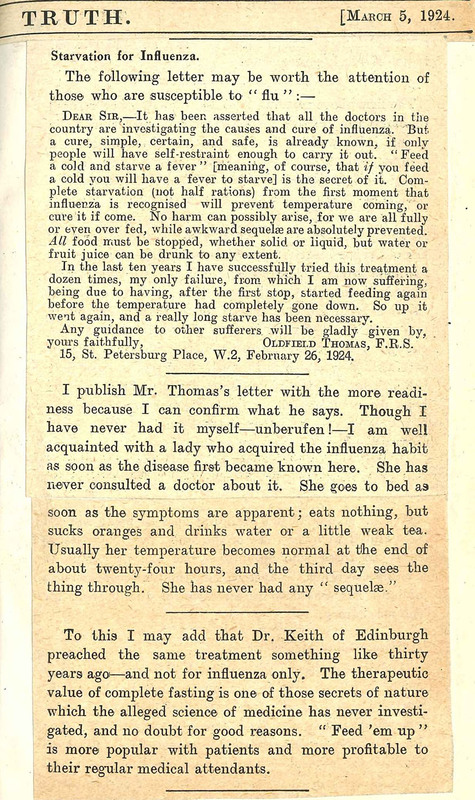 Even if his “solution” to the flu problem is questionable, Oldfield Thomas did take quite an interest in health matters. He lived to the ripe old age of 71, so he must have been doing something right. 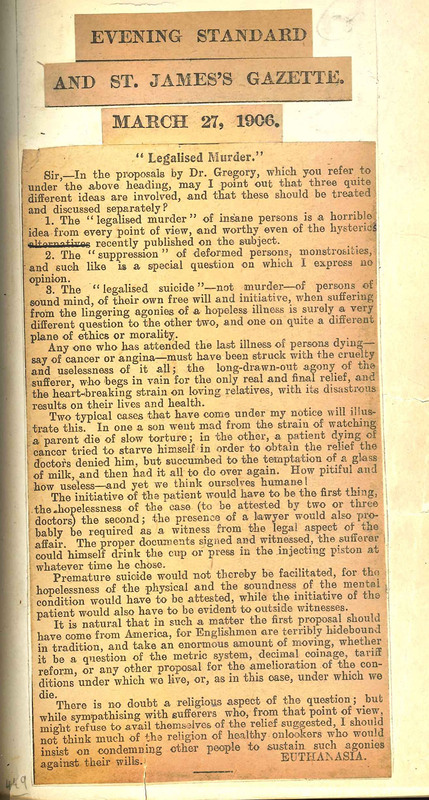 John Hill’s memoir reported that Oldfield Thomas published this letter on the very difficult topic of euthanasia. Uncharacteristically, and unlike any of the other letters, this one is not signed with his own name. Whilst this could raise some suspicion about the origin of such letter; it is utterly undeniable how Thomas felt about these matters. In fact consequent with his ideas, he took his own life in 1929. It is very difficult for anyone to be sharp and on top form all the time and Oldfield Thomas was no different. One guesses that this letter is praising the benefits of public signs that advise which side of the road to keep…but I really don’t know what happened after he finished the first paragraph. Subsequent paragraphs seemed a bit confused. I think this is the letter that best illustrates how connected Oldfield Thomas was to the rest of the world. He did not have to address this at all. He could just continue chipping away at his taxonomic work, but instead he decided to write about something that he thought was worth praising: the great value free entry to museums offered to the nation. And he beautifully phrased the fact that imposing entrance fees would be “a tax on knowledge and intelligence”. 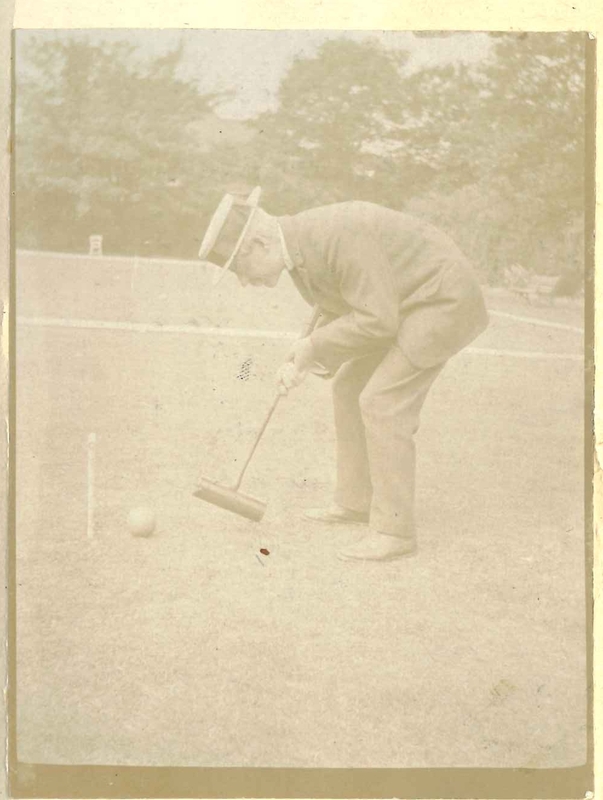 …and he still found time to play croquet.